From the outside, the basic black WorkPad z50 looks like a mini ThinkPad, and a roomy keyboard equipped with a Trackpoint stick completes the illusion. However, its small, dim screen is another story, as are its subpar performance scores. Although the WorkPad has some useful extras, few road warriors will want to spend hours squinting at it. 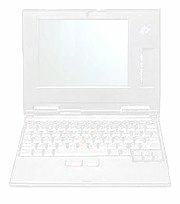 The WorkPad z50 is roughly the same size and shape as the Compaq Aero. However, its 8.2-inch LCD is much smaller. Given that the display is not a touchscreen, we were surprised at its somewhat lackluster appearance. With a luminance score of 33.3 cd/m2, the tiny Cassiopeia E-100 handily outclassed the WorkPad. The IBM also fails to make the most of its 131MHz NEC-made MIPS processor. Its WinCEMark of 30.5 was the lowest of all the CE units that we reviewed. While you won't notice hourglasses on basic tasks, Web surfing would probably take this unit to the brink. That's probably the reason IBM only included a 33.6Kbps modem. Nevertheless, the WorkPad regains some points in other areas—particularly power management. Users can purchase a high-capacity battery and an adapter for eight AA batteries that both snap into the same place in the spine of the unit. The standard Li-ion battery included with the unit turned in an extremely respectable 6 hours 15 minutes of battery life, and the AAs did even better, extending the runtime to 14 hours 30 minutes. It's a good option to have for foreign travel, especially since the unit has an inconvenient three-prong cord on its AC adapter. The WorkPad also offers a wide range of ports, including a video port in addition to the practically standard CF and Type II PC Card options. Given its low price, the WorkPad might not be a bad choice for users who really need long battery life, but they should prepare themselves for its poor screen.